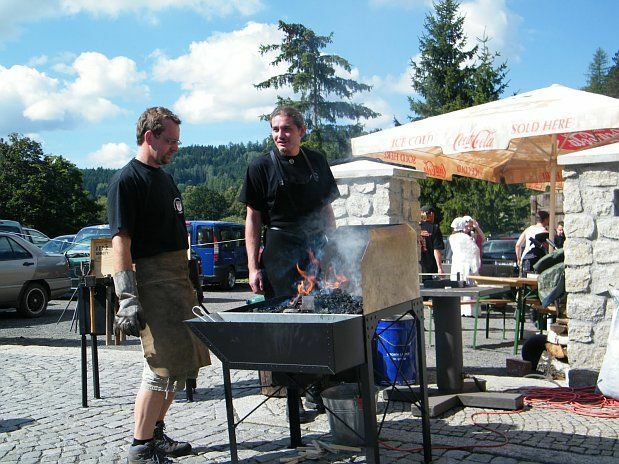 The charming and historic West Bohemian town of Bečov nad Teplou has just hosted its third international symposium showcasing the blacksmith’s craft. The two-day event gave the public the chance to get up close and feel the heat of the braziers as a series of top smiths showed that this is very much a craft making a comeback. 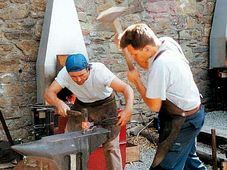 The sound of metal on metal together with the more modern mechanical sound of an electrically powered hammer that substitutes some of the muscle power of the smith could be heard in Bečov last weekend and down the Tepla valley. The sound would have been familiar in the not so long ago age when horses had not been replaced by horsepower and almost every village would have had a blacksmith. A few decades ago the craft looked like it had almost died out in the Czech Republic. 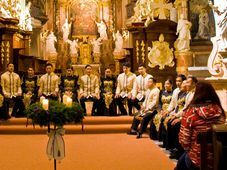 But now, as the Bečov symposium, testifies this is a craft that has come back from the brink and can pull in a lot of public interest. 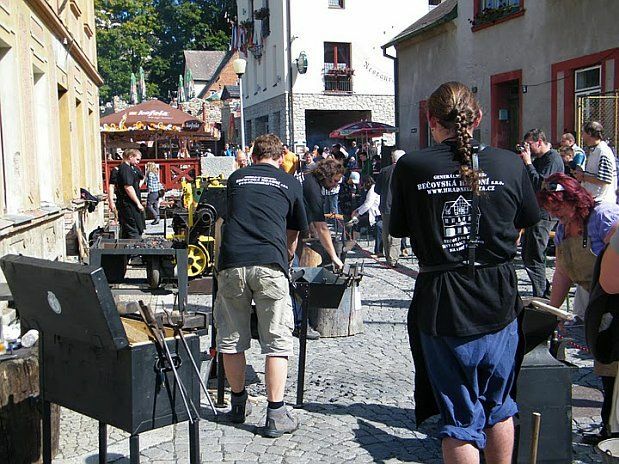 The national association of Czech blacksmiths has around 350 members. 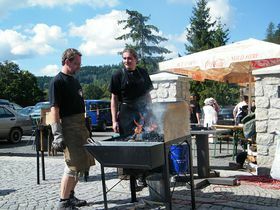 Ivo Rudolf (left), photo: www.hradnibasta.cz Ivo Rudolf who lives in the next village downriver of Bečov and has been a blacksmith for the last 30 years is the organiser of the symposium. 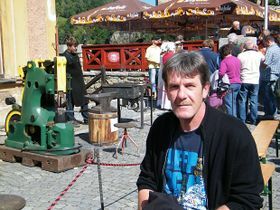 He got into the profession first of all as a blacksmith mending farm machinery. His more recent artistic craftsmanship can be spotted frequently around a town dominated by a medieval castle and baroque chateau. 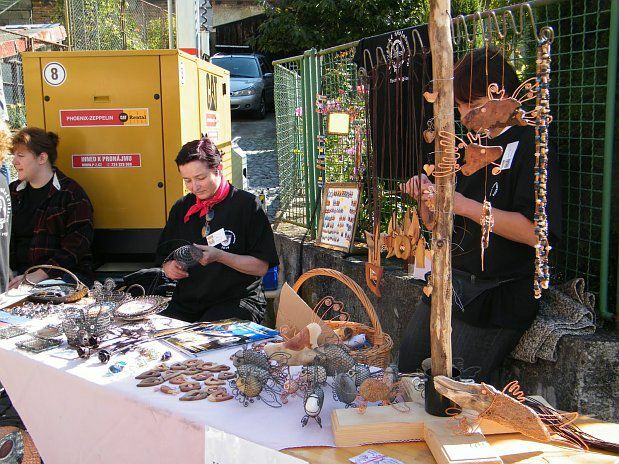 The work of other smiths was also on show at an al fresco exhibition under the arches of the bridge leading to the baroque chateau. 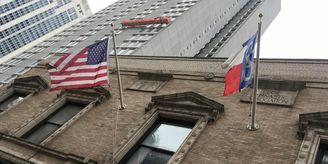 When it started three years ago there were a lot of Czechs but just a token presence from Slovakia and France. Representatives are mostly prize winners in their field who have been invited to take part in what is very much a showcase event. This year there was a record attendance at the symposium of 53 blacksmiths. 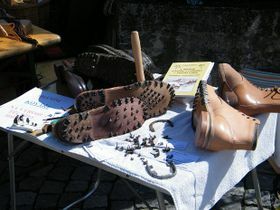 Hundreds of people must have watched enchanted as up to five craftsmen at a time hammered away in public. The event continued into the night with the fires casting mythical shadows of the men at work. Without much doubt the craftsman from furthest afield was Ken Akiyama. 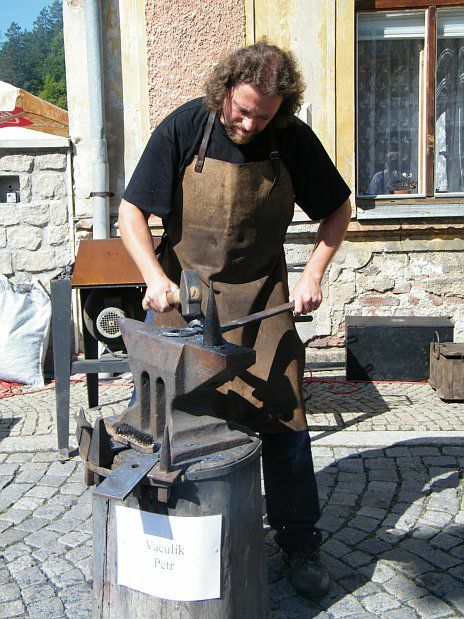 Originally from Tokyo, he is now studying with a master blacksmith at Tišnov, near Brno. The slight 30-year-old says that he could not have found this sort of training in his homeland. It should be pointed out here that katana is the traditional Japanese single edged, slightly curved warrior swords often associated with the samurai feudal traditional. 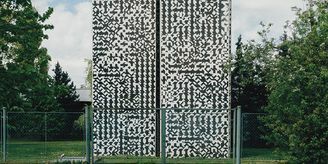 The student of architecture says that iron attracts him for its plastic qualities that lend itself to sculpture after experimenting with other materials such as glass and wood. He hopes to set up his own business in Europe after his studies have ended. Jean Pierre Fullenwarth has returned again to Bečov for the symposium from his home in the capital of the French region of Lorraine, Metz. He had what might be described as having a supporting role which he nonetheless enthusiastically fulfilled. One of the younger professionals participating was Jiří Oplt from around 50 kilometres away in the engineering and metal bashing west Bohemian city of Plzeň. 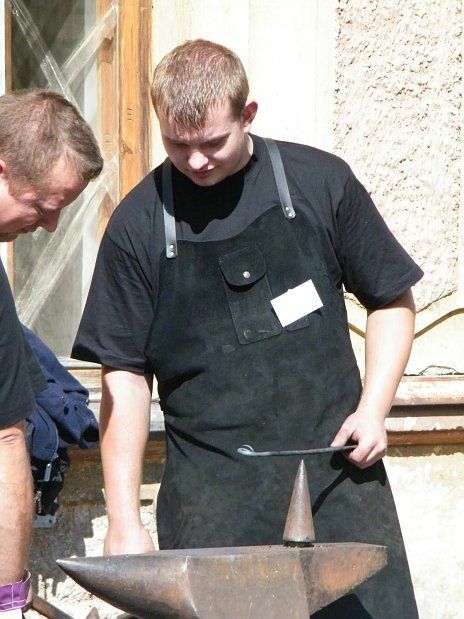 I spoke to him after they had just finished a two hour session fashioning a work of art out of a steel bar. I asked what the finished piece was meant to be. Jiří Oplt says that he decided to become a blacksmith although there was no such tradition in the family and there is no likelihood that it will make him rich quick. 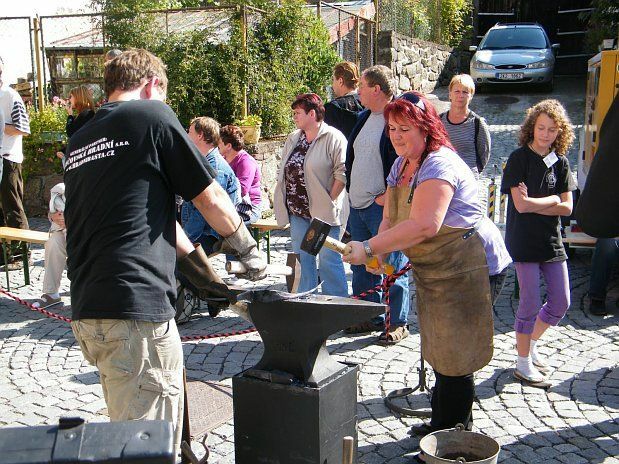 He and a grouping of other blacksmiths from the city contributed to its successful bid to be in the European spotlight in 2015 as the joint European city of culture that year along with the Belgian city of Mons. There is clearly a hope that the city of culture will bring more commissions their way. For him the symposium is a pleasant get together which also has a serious side to it. His preparations for the fourth symposium next year are already underway.